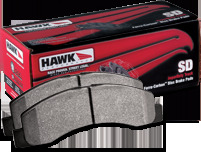 Hawk SuperDuty Brake Pads are the Ultimate in performance brake pads for trucks. Trucks that tow and haul heavy loads need brakes that can stop extremely heavy loads safely and reliably. Hawk SuperDuty brake pads are engineered to take the abuses of towing and hauling without losing braking power. One of the main causes of brake system failures is excess heat. Brakes use friction to stop a vehicle, and normally more friction means more heat. Hawk Superduty brake pads use a Ferro-Carbon brake pad material specifically designed to provide a high coefficient of friction with superior high temperature heat dissipation to reduce excess wear on brake components and eliminate brake fade. Hawk Super Duty pads are ideal for use if your truck is used primarily for extremely heavy loads. This is a no-compromise performance brake pad. The high amount of brake dust, noise, pad and rotor wear and vibration generated by Hawk Super Duty mean it is not the best choice for daily driven trucks that are used as commuters in addition to towing. For mixed-use trucks used for normal driving in addition to towing, the Hawk LTS is a better choice.